The Mammillaria genus is generally found in the southwest United States and Mexico, with some spread into the Caribbean. This huge genus of plants contains at least 275 species of highly variable form, and thus are highly prized among collectors. 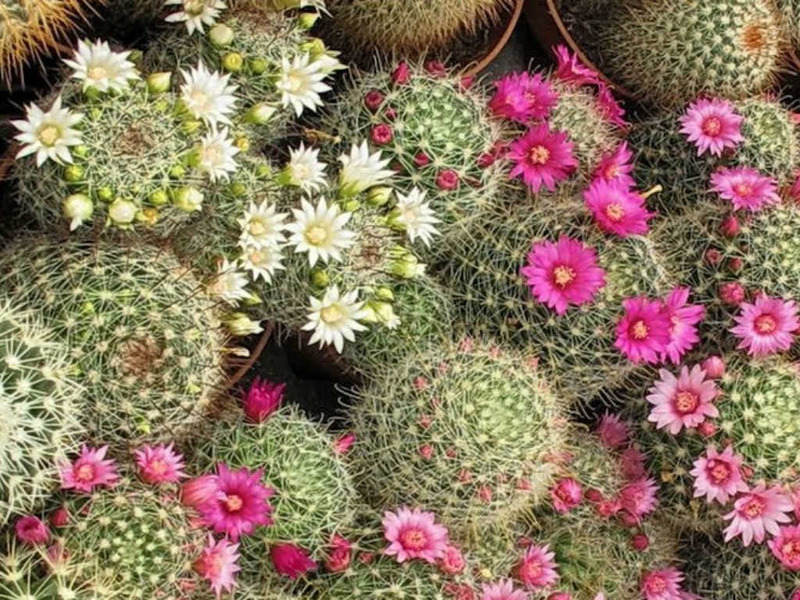 Mammillaria are common cacti at shows, as well as ordinary garden centers, both for their appearance and their desirable traits in cultivation. Although this genus does include some very difficult plants to maintain, the most common ones are usually very easy and will stay small enough and grow slow enough to provide years of enjoyment. When they do flower, many species flower with a “crown” of flowers that surrounds the top of the plant like a wreath. Light: Mammillaria species appreciate strong light, but many species dislike more than four hours of direct summer sunlight. Provide bright, even light for the best results. Water: Allow the soil mix to become nearly dry between waterings, but then water thoroughly. Immaculate drainage is essential, so never let the pots sit in water. Suspend watering in the winter, but mist occasionally. Soil: A rich, fast-draining cactus mix is ideal. Mammillaria cacti can be propagated easily from offsets, which readily form in clusters around the base of the mother plant. To propagate, carefully remove the offset and allow the cut to dry on a paper towel for a few days. Depending on the size of the cut area, a callous will form over the cut surface. Once the callous has formed, place the new plant in a pot with a potting soil mixture and keep in a warm place until new roots emerge. Once the plant is established, repot it into a regular container. Repot as needed, preferably during the warm season. To repot a cacti, make sure the soil is dry before repotting, then gently remove the pot. Knock away the old soil from the roots, making sure to remove any rotted or dead roots in the process. Treat any cuts with a fungicide. Place the plant in its new pot and backfill with potting soil, spreading the roots out as you repot. Leave the plant dry for a week or so, then begin to water lightly to reduce the risk of root rot.